I am pretty sure Mr. Shife and smartest guy in the room have not been uttered by too many human beings in the same sentence. Even if I am in a roomful of monkeys, my money is still on the primate with the long tail. Now if it was me and flaming bags of dog crap then I like my odds. Maybe it is just sleep deprivation but I just do some dumb stuff. For example, we had 2 Windex bottles in our cleaning cabinet. One was almost full and the other one was nearly empty so I decided to pour the almost empty one into the full one. I know I live an exciting life. Don't be hating. Well now the empty bottle is empty (this is going to look so good on the resume) and the other bottle is now full. Well then I put the lid/spray nozzle with the long, thin plastic tube thingy on the now completely full bottle and that displaces about 4 ounces of Windex all over me and the floor. Now the bottle is basically at the level is was at before I completed my stupid human trick. Hope your Monday has been enjoyable. It is a Tank sighting. 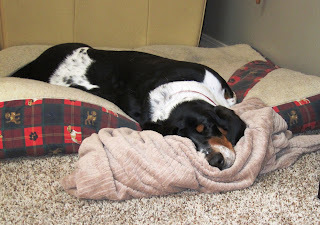 It has been awhile since our beloved basset got some time on the blog but here he is and as you can see he is doing OK. Thank heaven our pets don't know how 'smart' we are. ;-) Good to see Tank. Many scratchin's and treats for him from me. Yesterday I had two experiences which illustrated most kindly the displacement theory. So yes, I understand. Typical man move, done by millions before you. OMG how I laughed when I read this. You mean, you DIDN'T allow some air space...grins. Love the picture of Tank, he looks really relaxed. if you're gonna make an omelet you have to crack some eggs.